This was a surprise bargain. It came as a part of a big lot of pens I bought off fleabay. I bought the lot because I spotted some other nice pens and was surprised to find this; a Bordeaux coloured Montblanc 344 with barrel and cap in great condition. The only little problem was that it didn’t have a nib. I started out looking for nibs. Vintage MB gold nibs are rather expensive, but I found a seller at FPN who sold new old stock Montblanc steel nibs for a very good price. Not gold, but gold plated steel, but considering the great price I thought I’d give it a chance. I then had the nib mounted properly by a very nice and thorough Scottish pen doctor and when it came home again it felt like getting a new pen as a present. 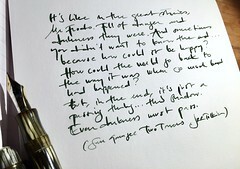 It also happened to be my second flexy nib ever – incidentally, just as the first one, and I was eager to try it out. This pen was made during the 1950’s. The design is classic and functional. A dark, dark burgundy red with goldplated details. Two things I particularly like is the sleek clip and the curved gripping section. A nice, non-blingy everyday elegance – made to be used. it is a tad bigger than the Pelikan M400, but nearer the M400 in size than the M600, but the weight is about the same as the Pelikan M600. Click on photos to view them in a bigger size. It is obvious that the 344 – being a part of the 3XX-series which was the lowest quality grade – is made to be used. The gripping section is comfortably curved, it posts very securely and doesn’t easily unscrew when capped. The plastic is very well preserved and doesn’t give the impression of being frail. Even if its nib was removed the piston still moved smoothly and didn’t require any particular service. The only drawback is that it is a piston filler without a window – the very thing that makes me favour piston fillers to other filling systems. But since the piston works so very well it is no major trouble. In all – this pen is still going strong after all these years which ought to say something about the quality. 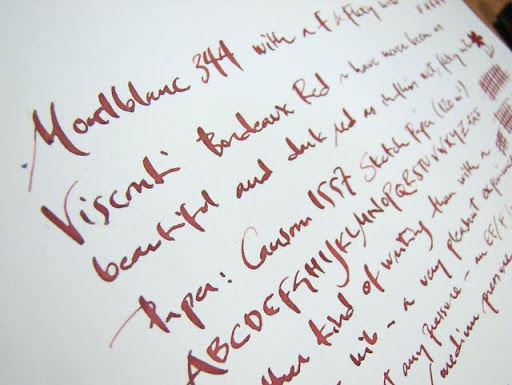 The main attraction of the 344 pen is, however – beside its pleasant exterior and build quality – the luscious, flexible nib. It is a steel nib that makes many modern gold nibs appear bleak and tame. Since it is a full flex nib it isn’t (if one isn’t very skilled, that is) suitable for fast note scribbling. Instead it makes a very nice and personal pen for letter writing and journalling – provided that the paper is very fountain pen friendly. Its wetness makes it a good tester pen – only the most superior paper stands the test. I wrote it in an earlier post, but say it again: Considering that I paid less for this – new nib and postage to the nib doctor – than most nib meisters charge for turning a nib into a flexy one – I think vintage is the best way of trying if flex is something for you. This is in all a great little pen that is a very welcome addition to my stable. This entry was posted in fountain pens, inks, j herbin, montblanc, note book, paper, pens, photo, reviews, rhodia, writing and tagged fountain pens, ink, j herbin, montblanc, pens, photo, review, rhodia, writing. Bookmark the permalink. I received the same one *in Black, from my mother’s friend. He graduated high school and university with it, and he gave the pen to me because he said it will bring me luck and I should have it. I love pens, I didn’t knew it’s so valuable. This is something to pass on from a generation to another. This is close to the best pen I have owned. The best was a Waterman I had been gifted for graduation that I have since lost. This Mont blanc pen too was a gift. I have used it daily and gone through 3 refills since purchase and will likely keep this pen forever. I don’t think it qualifies as a Francblanc since it has a MB nic ;-) . Lovely pen and congrats on a great find. Have fun with the flex, it can be challenging. As always, great review! Would love the details of your suppliers! Great find. I like the results on paper you get with it. I have to find myself a flex nib someday. Ooh, this is lovely, and that nib looks wonderful. A nice find, especially with its new nib.